How do I create stairs in Advance Concrete? 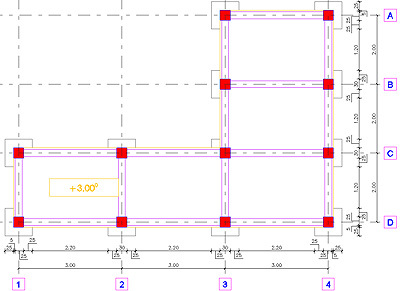 Let us consider a concrete structure with a level height of 3m and 0.15m slab thickness as in the following figure. 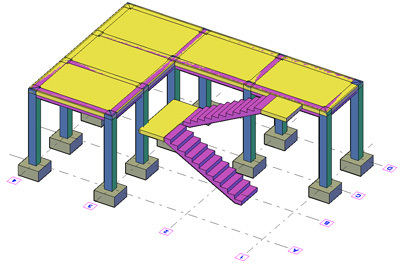 The "Create a stair in the current level" tool in the Advance Modeling toolbar creates a stair in the current level. Once the OK button is clicked and the stair generated, you cannot modify the parameters. 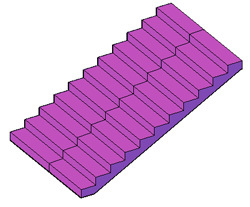 The stair is in fact a beam element and has the properties of a beam. 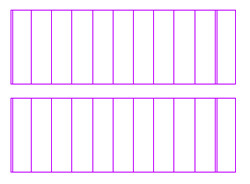 As the level height is 3m, create a stair with 20 steps with the height (A) = 0.15m and width (B) = 0.28m. 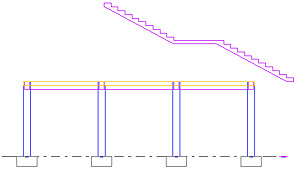 The sloped slab thickness (ramp) is C = 0.12m. For both, top and bottom step, define a height of 0.15m. 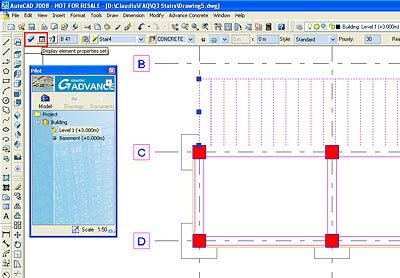 The parameters defining their size are set separately, allowing the adjustment of the steps height in case of a different floor slab thickness. 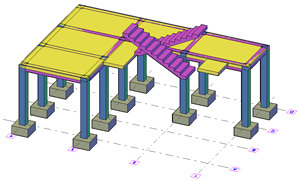 After setting the stair definition parameters, define the bottom and top anchor type. The top step is created inside the slab of the above level. 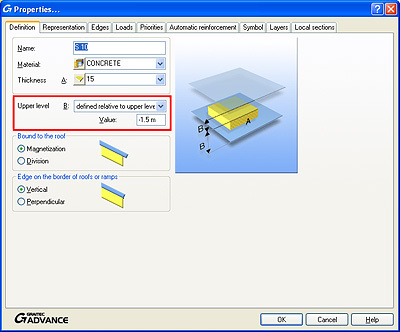 The bottom step is created in the slab of the current level. 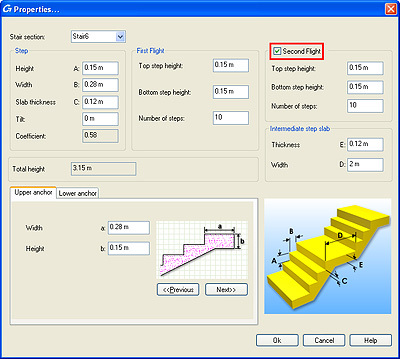 Once the stair definition parameters are set, click OK and select two points defining the stair width. 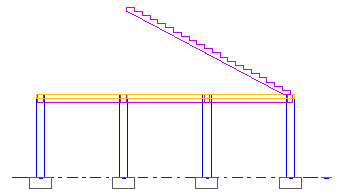 The two points define also the side on which the stair is created. 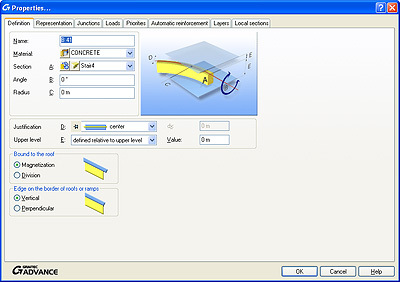 The total rise and the total run are calculated based on the step height and width. 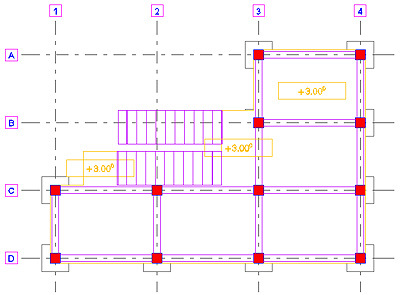 When placing the stair the size of the opening in the slab of the level above should be also taken into account. 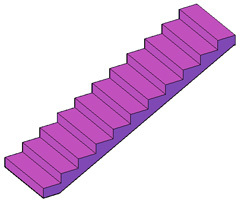 The two points in the figure above are defined relative to the upper level, meaning that the stair starts at 3.00m and ends up at +6.00. Select the stair and display the properties dialog box to place the stair in the desired level. Notice that the stair is considered as a beam and the properties dialog box corresponds to the beam element. 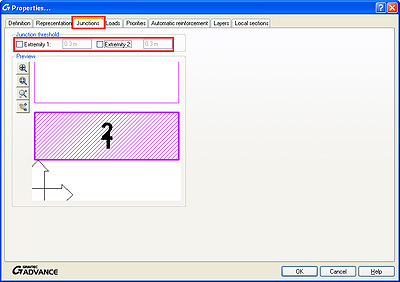 The parameter defining the element position in height is E (see the explanatory picture in the dialog box). 1st Method: The E parameter is defined relative to the upper level of the current floor. 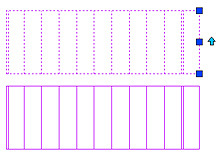 In this example, change 0m to -3.00m. 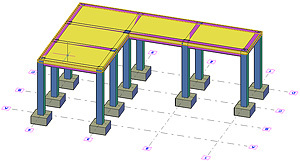 As seen in the picture above, the first step is included in the lower slab thickness and the last step in the upper slab. 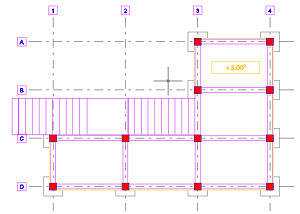 Therefore it is necessary to adjust the stair position in height with 0.15m representing the step height. The value of the E parameter is -3.15m in this case. 2nd method: The E parameter is defined relative to the lower level. In this case enter -0.15m for the E parameter. 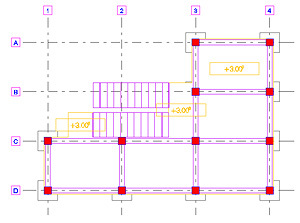 The position of the intermediate slab is determined by the number of steps in the first flight. 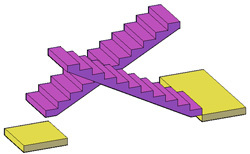 The top step of the first flight and the bottom step of the second flight are considered in the intermediate slab. Each flight has 10 steps, thus the intermediate slab is created at half-height of the level. Click OK and select two points as in the figure below. The stair width is 1.5m. 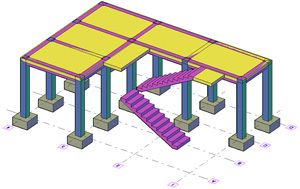 The stair is created in the working area, outside the model and should be placed in the model. 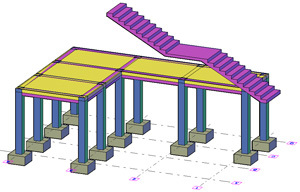 Use the AutoCAD® "Move" tool to place the stair in the desired position. 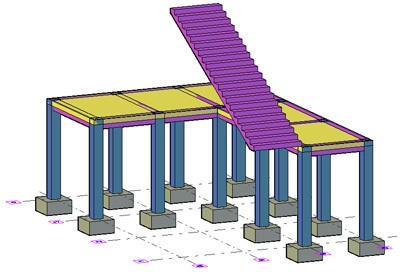 Using the same process as for the stair with one flight, modify the stair position relative to the upper level. 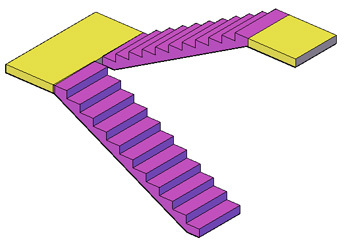 A two-flight parallel stair is another widely used type of stair. It consists of several independent simple elements. The two flights are straight single flight stairs and the landings are simple slabs. 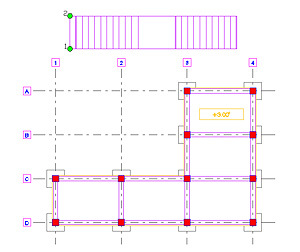 As the second flight is identical to the first one, use the AutoCAD® "Mirror" tool to create it. If the newly created stair is too close to the first one, Advance joins them. 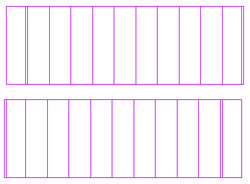 In this example there are 0.20m between the two stairs and the software creates a junction. 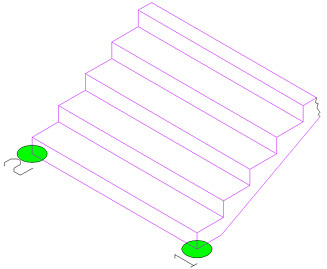 To display the stairs separately it is necessary to modify the junction value. Select one of the two stairs and right-click to display the properties. On the Junctions tab modify the junction value at both extremities. Make sure the value is smaller than the distance between elements. 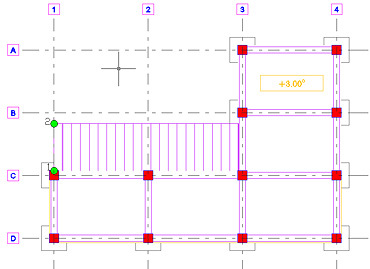 Using the AutoCAD "Move" and "Mirror" tools, modify the stair direction. 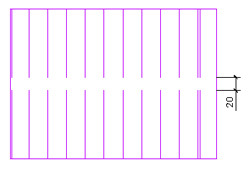 Select one of the two flights, mirror it about the line with grip points (in blue in the figure below) and delete the original entity. 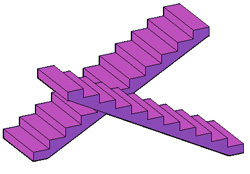 Use the "Move" tool to align the stairs. Next, create two slabs for the stair landings. Both, stairs and slabs are created in the above level. Their position should be adjusted to place the stair in the current level. Use the same process as for the single flight stair for each entity in the stair. For the fist flight, in the properties dialog box, change the E parameter to -1.65m relative to the upper level. For the second flight, the E parameter is -0.15m relative to the lower level. Finally, place correctly the landing slab. Select the slab and right-click to display the properties dialog box. The parameter defining the vertical position for the slab is B (as in the explanatory picture in the dialog box) and should be -1.5m relative to the upper level. 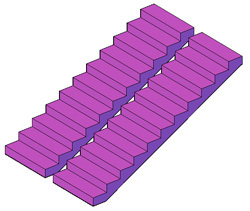 The stair is correctly placed in the model.